Rebooting Linux systems with Ansible has always been possible, but was tricky and error-prone. In Ansible 2.7, I am happy to say that rebooting Linux hosts with Ansible is finally easy and can be done with a single task using the newly minted reboot plugin. The win_reboot module was written by Matt Davis and included with Ansible 2.1. Rebooting Windows hosts is a much more common occurrence than rebooting Linux hosts. Necessity is the mother of invention, so it made sense that win_reboot appeared before the equivalent for Linux. And while less than elegant, it is possible to reboot Linux hosts using shell and wait_for or wait_for_connection1. Rebooting Linux systems with Ansible never felt right to me — much too error prone and finicky. It finally bugged me enough that I refactored win_reboot into reboot so Linux hosts could join the reboot party with their Windows counterparts. A little known feature of Ansible Vault is the ability to use a script as the Ansible Vault password file. Alternately, you may specify the location of a password file or command Ansible to always prompt for the password in your ansible.cfg file. I work on many Ansible projects, each using separate Ansible Vault keys. It became very tedious to enter the password on the command line every time and I really don’t like storing keys unencrypted on disk.1 Luckily, macOS, my development platform of choice, has a built in system keychain as well as a command line tool for retrieving things from it. 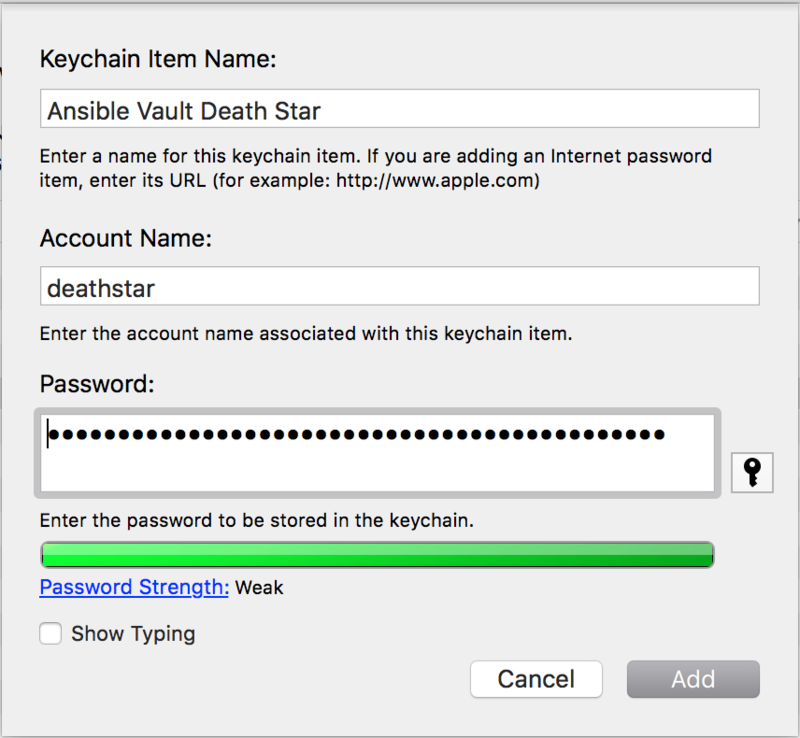 I wrote a script that would retrieve the appropriate Ansible Vaulte key from the macOS system keychain based on my current working directory. This allows me to set my vault_password_file once in the Ansible config (or you could use the ANSIBLE_VAULT_PASSWORD_FILE environment variable) and it will always get the correct key based on the current project I’m working on and fall back to a default key. The first step is to store the keys in Keychain Access2. Open Keychain Access and click File > New Password Item…. You’ll be prompted to enter three bits of information: the Keychain Item Name, Account Name, and Password. Account Name is the name you will pass to the security command line tool in order to retrieve the password. Since this is a command line parameter, I like to keep it all lowercase without spaces. I just use the lowercase name of the project I’m working on. Naming them this way makes it easy to find all your Ansible Vault keys with a simlpe search. In order for Ansible to use this, you must make it executable by using chmod +x getvaultkey.sh and set vault_password_file in your ansible.cfg or the ANSIBLE_VAULT_PASSWORD_FILE environment variable to the script location. It doesn’t need to be in your PATH. I like to keep my scripts in ~/bin, which is in my PATH just so things stay tidy. You can customize the script to add additional case statements based on the paths of projects you are working on. Essentially this is constructing a single command that when run will print out a password and only a password3. Hopefully this will make using Ansible Vault on macOS much easier. The dark art of color management has been around for quite some time. With the high color gamut camera and display in the iPhone 7, all of sudden people who never had to worry about color management are wondering why the images in their web browser look funny. The first book I read on the subject was Real World Color Management by Bruce Fraser. It was an excellent and fascinating book, covering topics from physics and the human eye to the mathematical way color is described in computers. It’s an excellent book, but not for the faint of heart. It was tough to get through, but I needed the knowledge at the time since I was working as a photographer and graphic designer. Craig Hockenberry’s new book is a much more approachable take on the subject. Color management is still tough, but I can’t think of anyone better suited to tackle the subject for a new generation of professionals who never gave a thought to consistent color reproduction. Once you wrap your head around color management, it’s a great skill to have. You’ll become “that person” on the team who can get the colors to look right. Making yourself indispensable is always a good thing. But more importantly, you’ll spend less time pulling out your hair wondering why in the world your color looks different than it did on your screen. Ansible Fest is one of the best run conferences I have ever been to and I am thrilled I was able to contribute in some small part to its success. My absolute favorite part of Ansible Fest was getting to work the Ask an Expert table. There I got to meet some of our wonderful customers who always challenge me in new and exciting ways. I’m honored that I get to help them as best I can. What a privilege! Check out the video if you’re interested at all in Ansible and security. Stay tuned for announcements of Ansible Fest in 2017. I hope to see you at the next Ansible Fest! 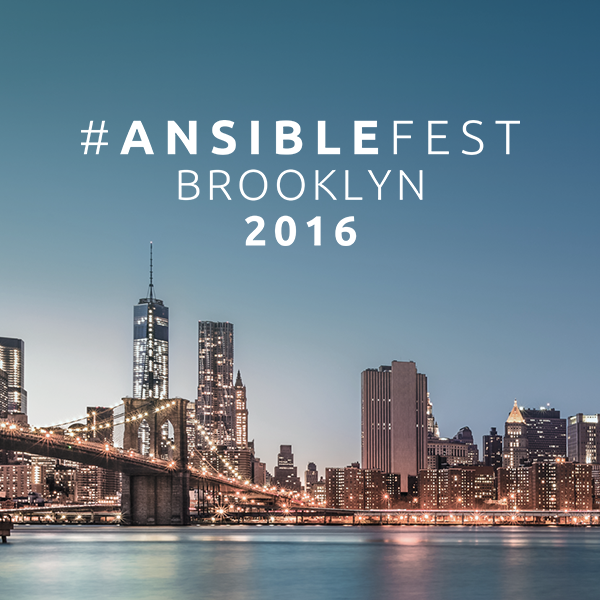 I’ll be giving a talk on security automation at Ansible Fest Brooklyn 2016. If you care at all about security and finding ways to automatically and consistently fix vulnerabilities, you should attend. I’ve been hardening Linux systems for many years and Ansible is by far the best tool for the job. I love using Ansible to solve problems, especially security related problems. Ansible Fest is the best way to meet the folks at Ansible, get updates on the future of the project, and learn about fun and exciting ways people are improving their lives through automation. I hope to see you in Brooklyn!